At the start of this breathtaking novel, Damen and Ever travel to Summerland in search of an antidote to reverse a powerful poison. But instead of the cure they seek, they find something far more sinister: the truth about their existence and the fate lying in wait of an immortal’s soul. Now, with Damen fighting to save them from the Shadowland, Ever turns to magick, hoping to break Damen’s curse. Along the way Ever encounters the mysterious Jude, finding herself drawn to him in a way that will test her love for Damen like never before . . .
At first when start with the Immortals series I loved it! Evermore and Blue Moon were just totally great so the books set off to a great start. 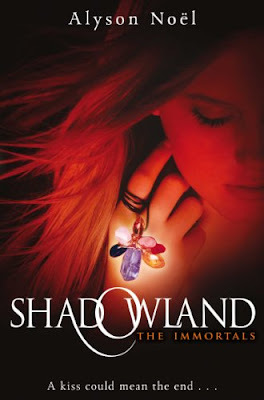 I saw that as soon as I started reading Shadowland but as I read on the more I disliked. Okay so I really wanted to know what's going to happen in the whole Ever and Damen's forbidden love thing. I mean the plot it great, what's not to like? But it's just mainly because of how the storyline didn't seem to go anywhere. Everything was pretty much the same from the way things were from Blue Moon. More and more, Ever is really starting to annoy me. So at first you make mistakes. Then another yeah its still okay. But then she keep on making the same mistakes over and over again and yes, it does get very frustrating at times. I would of liked it better if there was some self improvement and growth. But no. Still the same Ever. Oh and what happened to Haven and Miles? There never in the picture anymore. Does she even have any friends now? I have no idea. oh gosh i really really love how all alyson's book titles are related to something we find out in the book, even though thats the point of a title i just keep getting amazed by it :) love the review !! Looks like a good book, I think I have to check it out.